On Feb. 6, 1832, Treasurer George Ridout and seven benchers met for the first time in Osgoode Hall, marking the beginning of the Law Society's 175-year association with the building. 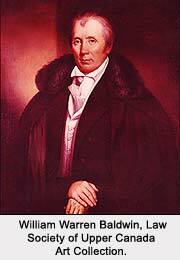 The Osgoode Hall of 1832 was not nearly as large as it is today. The building that opened in that year was "a plain three-story brick building in Regency style with few lavish touches." 1 That building forms what is now the east wing, housing the Benchers' Quarters. Before the Law Society took ownership of Osgoode Hall, benchers held meetings of Convocation in the York County Court House on King Street, and sometimes in the law chambers of Treasurers. In addition to financial discussions at that meeting of Convocation, the benchers named William Warren Baldwin Treasurer for his fourth term in that office, a position he held for another four years. The Minutes also record matters relating to the education and admission of new members. It was noted that Burrage T. McKyes would soon be called to the Bar, and that Mr. John F. Barrett of Kingston would be admitted as a "Student of the Laws." Two other prospective students, Richard Duggan and Colley Foster, were called in and partially examined by the benchers to determine whether they were suitable candidates for admission as students, and their examination was to be continued the following day. 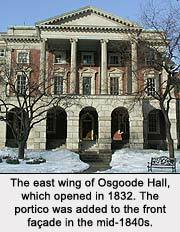 With that historic meeting of Convocation on 6 Feb. 1832, the Law Society began its long association with Osgoode Hall. Later in the 19th century new construction projects added to the existing building so that by 1860, the front of the building looked much like it does today. Osgoode Hall remains a historic landmark of the City of Toronto, but few passersby or visitors realize that it dates back to the time when Toronto was still the Town of York. 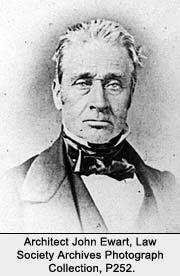 1.Christopher Moore, The Law Society of Upper Canada and Ontario's Lawyers 1797-1997 (Toronto: University of Toronto Press , 1997), 82. 2. Law Society of Upper Canada, Minutes of Convocation, Vol. 1, 6 Feb. 1832, 248. 3. Moore, Law Society , 83.